Manukau City is a former territorial authority district in Auckland, New Zealand, that was governed by the Manukau City Council. The area is sometimes referred to as "South Auckland", although this term never possessed official recognition and does not encompass areas such as East Auckland, which was within the city boundary. It was a relatively young city, both in terms of legal status and large-scale settlement – though in June 2010, it was the third largest in New Zealand, and the fastest growing. In 2010, the entire Auckland Region was amalgamated under a single city authority, Auckland Council. Territorial authorities are the second tier of local government in New Zealand, below regional councils. There are 67 territorial authorities: 13 city councils, 53 district councils and the Chatham Islands Council. District councils serve a combination of rural and urban communities, while city councils administer the larger urban areas. Five territorial authorities also perform the functions of a regional council and thus are unitary authorities. The Chatham Islands Council is a sui generis territorial authority that is similar to a unitary authority. The Manukau Harbour is the second largest natural harbour in New Zealand by area. It is located to the southwest of the Auckland isthmus, and opens out into the Tasman Sea. Franklin District was a New Zealand territorial authority that lay between the Auckland metropolitan area and the Waikato Plains. As a formal territory it was abolished on 31 October 2010 and divided between Auckland Council in the Auckland Region to the north and Waikato and Hauraki districts in the Waikato Region to the south and east. The Auckland portion is now part of the Franklin ward, which also includes rural parts of the former Manukau City. Pukekohe is a town in the Auckland Region of the North Island of New Zealand. Located at the southern edge of the Auckland Region, it is in South Auckland, between the southern shore of the Manukau Harbour and the mouth of the Waikato River. The hills of Pukekohe and nearby Bombay Hills form the natural southern limit of the Auckland region. Pukekohe is located within the political boundaries of the Auckland Council, following the abolition of the Franklin District Council on 1 November 2010. Drury is a rural town near Auckland, in northern New Zealand. Located 36 kilometres to the south of Auckland CBD, under authority of the Auckland Council. Drury lies at the southern border of the Auckland metropolitan area, 12 kilometres to the northeast of Pukekohe, close to the Papakura Channel, an arm of the Manukau Harbour. Titirangi is a suburb in the Waitakere Ward of the city of Auckland in northern New Zealand. It is an affluent, residential suburb located 13 kilometres to the southwest of the Auckland city centre, at the southern end of the Waitakere Ranges. In the Māori language "Titirangi" means "long streaks of cloud in the sky", but this is often given as "fringe of heaven". South Auckland is an imprecisely defined urban area of Auckland, New Zealand, with a young population, a relatively large Polynesian and Māori demographic, and lower incomes than other parts of Auckland. The name South Auckland, though not an official place name, has come into common use among New Zealanders. It also appears in the names of some organisations and companies. 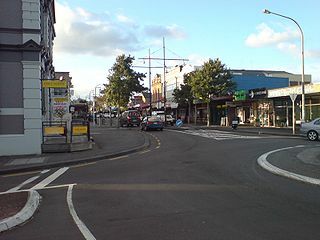 Onehunga is a suburb of Auckland in New Zealand and the location of the Port of Onehunga, the city's small port on the Manukau Harbour. It is eight kilometres south of the city centre, close to the volcanic cone of Maungakiekie/One Tree Hill. It was formerly governed by Auckland City Council until the merger of all of Auckland's councils into the 'super city' in 2010. Blockhouse Bay is a residential suburb of Auckland, in New Zealand's North Island. It is sited on the northern coast of the Manukau Harbour, and is also close to the administrative boundary that existed between Auckland City and Waitakere, two of the former four cities of what was the Auckland conurbation before amalgamation into Auckland Council. Mangere, is one of the largest suburbs in Auckland, in northern New Zealand. It is located on mainly flat land on the northeastern shore of the Manukau Harbour, to the northwest of Manukau City Centre and 15 kilometres south of the Auckland city centre. It is the location of Auckland Airport, which lies close to the harbour's edge to the south of the suburb. Otahuhu is a suburb of Auckland, New Zealand - 13 kilometres (8.1 mi) to the southeast of the CBD, on a narrow isthmus between an arm of the Manukau Harbour to the west and the Tamaki River estuary to the east. The isthmus is the narrowest connection between the North Auckland Peninsula and the rest of the North Island, being only some 1,200 metres (3,900 ft) wide at its narrowest point, between the Otahuhu Creek and the Mangere Inlet. As the southernmost suburb of the former Auckland City, it is considered part of South Auckland. The Counties Manukau rugby league team represents the Counties Manukau zone in the Albert Baskerville Trophy. Previously, teams representing Southern Auckland and the Franklin district of New Zealand have competed in the Lion Red Cup and Bartercard Cup. They are nicknamed the Stingrays. The Auckland Rugby League (ARL) is the governing body for the sport of rugby league in the Auckland Region of New Zealand. It is responsible for rugby league in the region, including both club and school rugby league.